Remove the tart from the fridge. Spread a generous amount of strawberry jam on top of the chocolate ganache almost covering the entire top of the tart. Leave a little bit of space between the jam and the top edge of the crust. Place the chocolate, butter and salt into a large mixing bowl. Set aside. Place the cream into a saucepan and bring to a boil over high heat. Immediately remove the cream from the heat and strain into the mixing bowl over the chocolate. Stir until the chocolate and butter until it is melted and smooth. Stir in the vanilla extract. Use as directed in recipe. 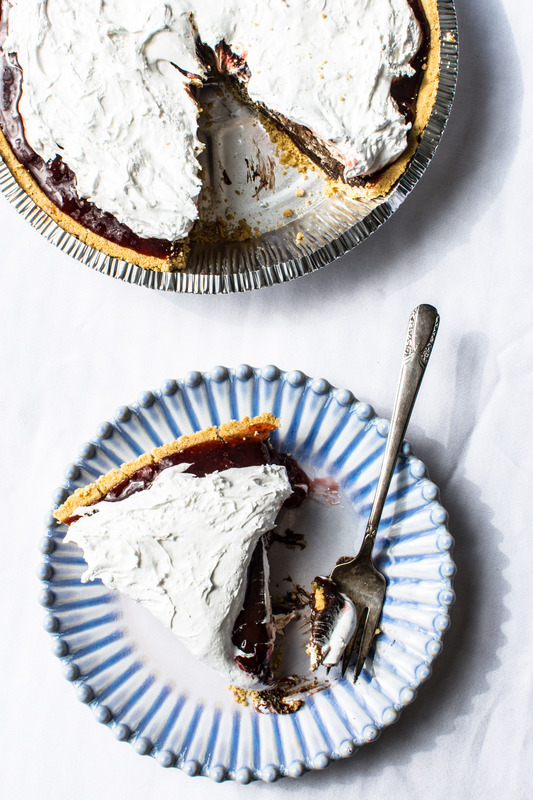 (For the s’mores tart pour the chocolate ganache into a graham cracker pie crust. Place into the fridge and chill until hardened, about 2-3 hours). Author note: This recipe requires a candy thermometer. Combine the water, sugar and corn syrup into a sauce pan. Stir to combine. Cook over high until it reaches 240 degrees (about 15 minutes). Do not stir while the corn syrup mixture is cooking. Meanwhile, with an electric mixer on high whip the egg whites and cream of tartar in a large stainless steel bowl until stiff peak forms, about 3-4 minutes. Once the corn syrup mixture has reached 240 degrees, remove it from the heat. Lower the mixer speed to low and slowly pour the corn syrup mixture into the egg white peaks. Once the syrup has been poured into the egg whites, increase the speed to medium high and continue to whip until the marshmallow crème is fluffy, about 7 to 8 minutes. Let the marshmallow crème “fluff” cool. Place in airtight containers and store in the fridge up to two weeks. This entry was tagged a pleasant little kitchen smores tart, dallas food blog, dallas food blogger, easy valentines day dessert, homemade s'mores tart, no bake valentines day, smores tart, strawberry smores tart, texas food blog, texas food blogger, valentines recipe, what to make on valentines day. Bookmark the permalink.